The passage of a souterrain lies on the edge of an elevated escarpment above the river Boyne. It is of drystone construction and consists of a simple, unrestricted passage leading into a small terminal chamber entered via an ante-chamber. The original entrance is blocked. It is aligned E-NE/W-SW ( L 6.5m, Wth 0.8m, H 1.1m) before it turns SW towards the terminal chamber ( L 3.8m). This is corbelled with an oval plan (dims. NE-SW 2.5m, N-SE H 1.7m). It is built of drystone walling with local limestone and sandstone. Greywacke is used in the capstones of the chamber. 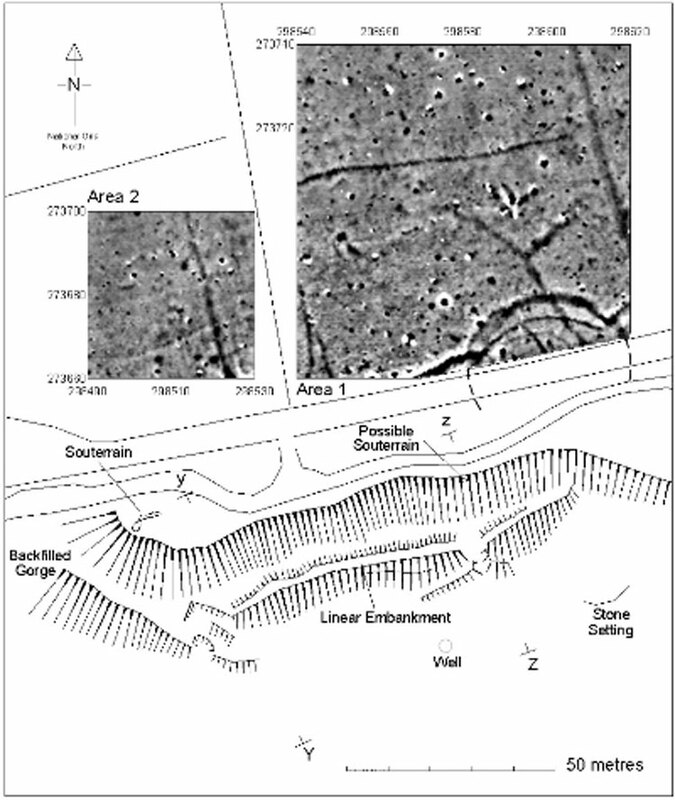 A detailed archaeological and geophysical survey of the immediate area was carried out in 2010 during which a number of additional and potentially significant archaeological features were identified (Fenwick, Dowling and Schot 2010). These previously unrecorded features include a second potential souterrain, a substantial earthen embankment, a low-relief linear earthwork and a well, in addition to geophysical evidence of a large circular, or sub-circular, enclosure (possibly a ringfort) (ME019-090---) and an adjacent field system (ME019-091----). All are situated in close proximity to one another on elevated ground overlooking the River Boyne, some 200m to the south. (Fenwick et al. 2012) Compiled by: Geraldine Stout Date of upload: 11 November 2013 See attached jpeg image which shows location map of souterrain and other archaeological features, taken from Fenwick, Dowling and Schot 2010 report.